Welcome to Yasodhara Yoga Ottawa, a community of aspirants who have come together to deepen their understanding of how to bring yoga into their daily lives while offering classes to the larger Ottawa community. 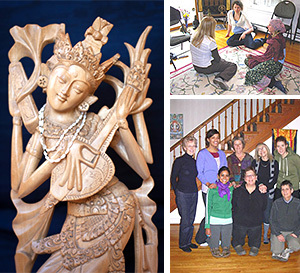 We offer Satsang and yoga classes at our centre at 65 Ruskin Street in Ottawa and workshops at Surround Circle Yoga as well as hosting an annual retreat and workshops offered by senior teachers from Yasodhara Ashram. Our class sizes are kept small, and the Yasodhara practices we offer are reflective and practical. We welcome people of all ages, abilities and spiritual traditions. We would love to have you join our weekly Kundalini Yoga classes and our monthly workshops as well as our Monday evening Satangs. Our next workshop at Surround Circle Yoga is April 13 from 1-4 pm For more information please go to ‘events’ under ‘classes’.